I talk to your present condition, and put it on the www because it will probably be more generally helpful. First, a discussion of the article in April 2013 could be helpful. Discussion . However, this is merely a recent development – experimental proof that classical electromagnetic theory is fatally flawed. Much more important is what happened in May 1976, and has been ignored. That is the discovery of “Theory C”. Contemplate the animation in The Catt Question . Off to the left a battery delivers energy/power, guided by two conductors. Off to the right is a lamp connected to the two conductors. The energy from the battery lights the lamp. The energy travels from battery to lamp at the speed of light. See Figure 4 and 5 . The bottom of the last paragraph here describes the following three theories. The general view is that the battery delivers electricity into the conductors. 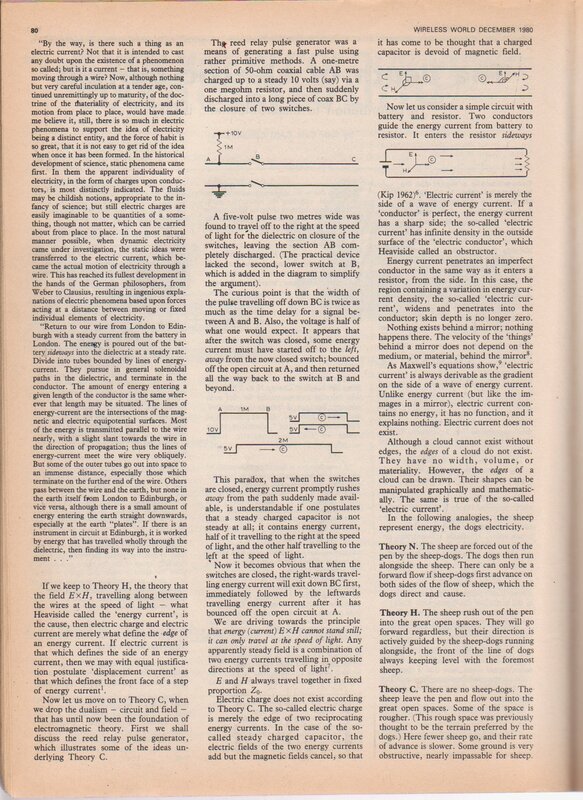 The electricity in/on the conductors then causes the fields between the conductors. I christened this “Theory N”, the normal theory. Oliver Heaviside’s greatest achievement, in around 1880, was to say; “We reverse this”. The battery delivers field between the conductors. The field then causes the electricity in the conductors. I christened this “Theory H”. When a battery lights a lamp, electricity is not involved. It is generally agreed that the conductors guide the energy, which cannot penetrate the conductors, or penetrates imperfect conductors with difficulty.At this point, the question arises of whether electricity exists. This question is not within the remit of Theory C. However, if it disappears from what I think is its primary remit, to help a battery to light a lamp, then its total future is seriously in doubt. The total removal of electricity would destroy a large proportion of 20th century Modern Physics. Lurking in the shadows is “electricity”, or the electron, composed of circulating fields. However, such “electricity”, or field, in the conductors above, guiding the field between the conductors, would obviously be absurd. Such “electricity” could not help a battery to light a lamp.